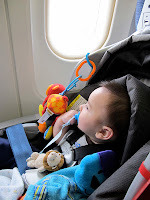 An interesting change in KLM's on board car seat policy has been identified by Corinne at Have Baby Will Travel... You now have to make a reservation to bring your car seat on board. On the plus side, hopefully this will alleviate some of the issues that arise when the passenger in front can't recline their seats! But I can't help wonder if this is a veiled way to limit the number of infants and toddlers on board flights. With all the griping about kids on planes, I wonder if other airlines will follow suit?